If your family is the most important thing to you, you would do everything to ensure they are safe, and with the growing use of electronic appliances one can never be too careful. As a family owned business for over 40 years, we at Wakefield Electric know just how important it is. Whether it’s using the computer, watching your favorite TV show or a simple thing like charging a smart phone, the quality of power is critical. Our certificate and skill experts at Wakefield Electric recommend you protect your home with surge protection. Firstly, you may be wondering what is surge? Surge is the sudden quick increase in voltage, although usually small and unnoticed to our eyes over a period of time these surges can be dangerous and can damage sensitive electrical appliances in our homes, workplaces or anywhere electrical appliances are used! Voltage surges are created by equipment all around us such as hair dryers, dishwashers, vacuum cleaners, copier machines, power tools, etc; it can also be created by a single lightning strike nearby or by a bad storm. Protecting your home with surge protectors will either reduce the electricity pikes, or stop them from entering your house altogether. This guarantees the safety of your appliances and family. Just think about the money you’re going to save if a surge hits! Our trained technicians have years of experiences in such fields and we are well recognized for our outstanding electrical surge protection service offered to throughout Orange County at very reasonable prices. So don’t wait until your appliances are destroyed and pay hundreds of dollars to repair or replace them! 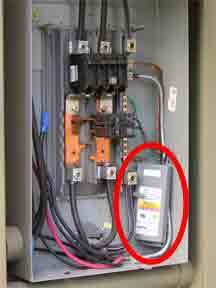 Contact us now and have a surge protector installed at your home without delays!